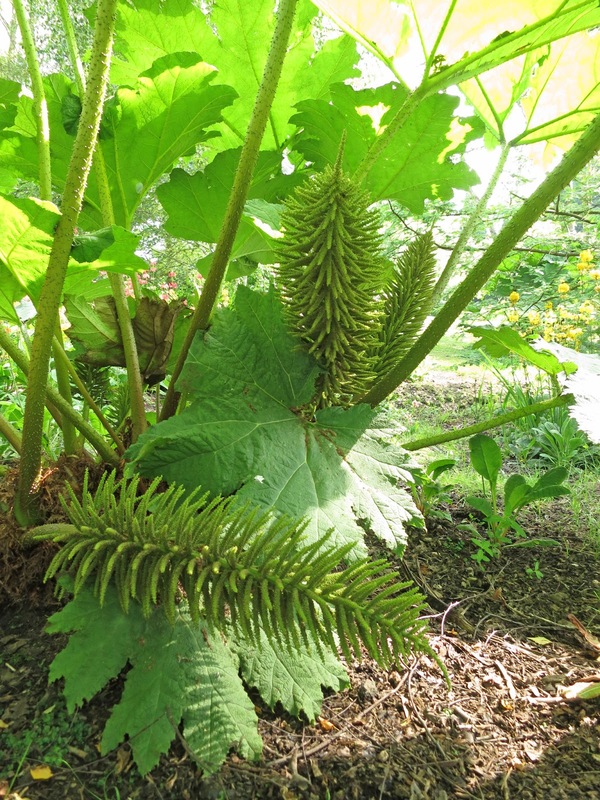 To get an idea of size - this Gunnera plant goes right up to the top left hand corner of the photo. 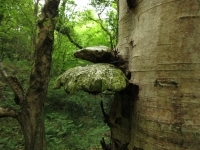 A plant as big as a tree with giant leaves which would be at home on a pre-historic film set. Congratulations to Everyone who posted about their trees in July. It's a hot month. It's a busy month (holidays to arrange perhaps) and it's tempting to assume not much is happening up there in the branches or down there in shade. But I'm pretty certain we all found it a rewarding exercise and discovered things we would never have noticed if we hadn't taken the time to stand still and look. spikes are at ankle and knee level. You may need to crouch or crawl to see them. I confess, as I write this, I have not yet read everyone's post. I mentioned being busy in order to get my excuse in quick! And one of the reasons I'm behindhand is that I'm catching up with the things I didn't do while I was away in the New Forest. June is, of course, receding fast but that's simply how it is; what you didn't do then you have to do now. 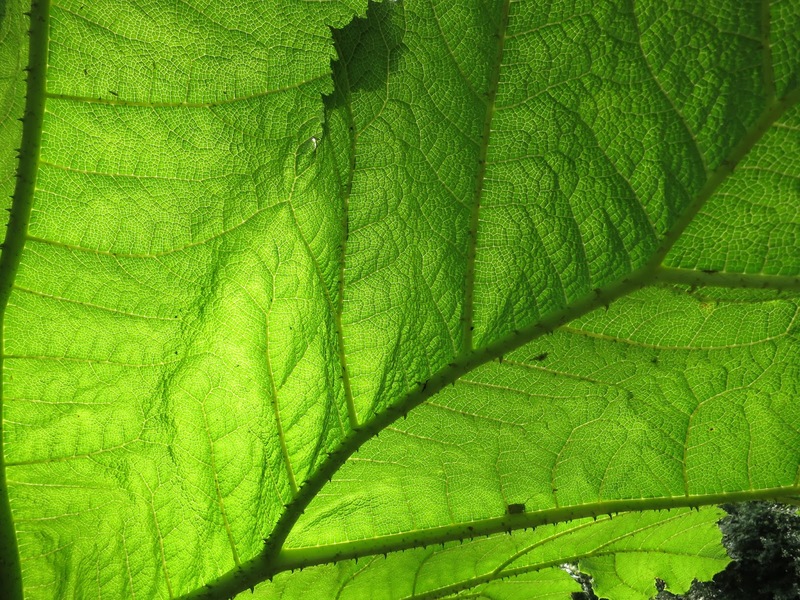 It's surprising how much light reaches the ground through gunnera leaves. In the autumn, I wrote a post about What to Expect on Loose and Leafy and I promised to introduce you to plants and scenes you'd hardly associate with Dorset. At the time, I was planning to visit The Subtropical Gardens at Abbotsbury through the seasons. Then the council dug up the road. And it stayed dug up for ages. And the idea didn't exactly go cold but did sort of temporarily shrivel so as yet . . .
Vegetative debris lands and rests on the up-side of the leaves. 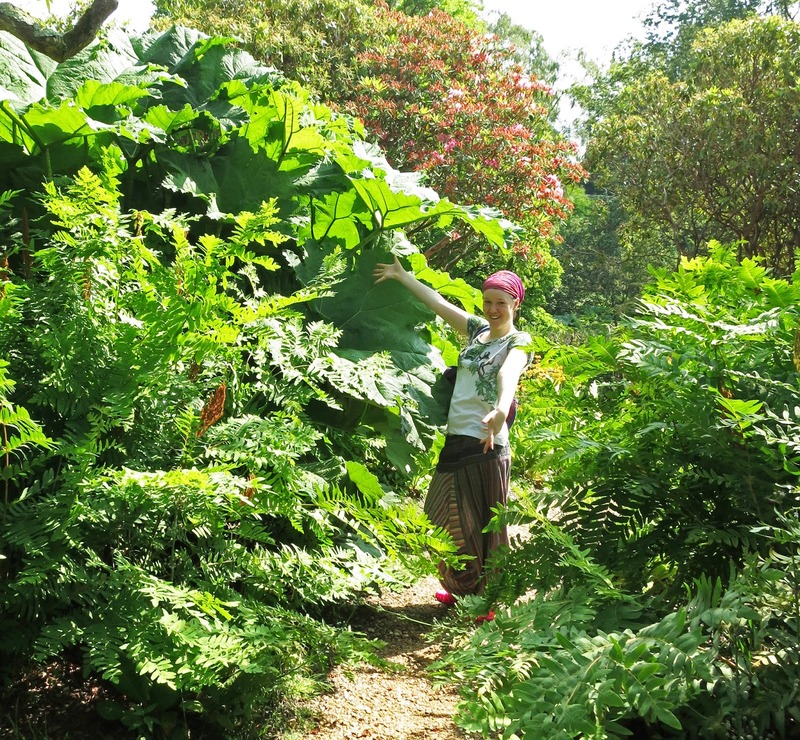 But one of the things I like about Abbotsbury Gardens is the way you can walk between massive Gunnera plants. Plants as big as trees! And one of the things I did in June (instead of being busy at home) was to visit Furzey Gardens in the New Forest where . . . (amongst other things) there are Gunneras. It's a giant plant with giant prickles! So I thought I'd take this as an opportunity to show you. I suspect they aren't to everyone's taste - but they definitely are to mine! All photos in this post were taken in Furzey Gardens. Furzey Gardens is (amongst other things) part of the Minstead Project where young people and adults with learning disabilities learn to be excellent gardeners. (I'm even more resolved now to re-visit the Gunneras at Abbotsbury! 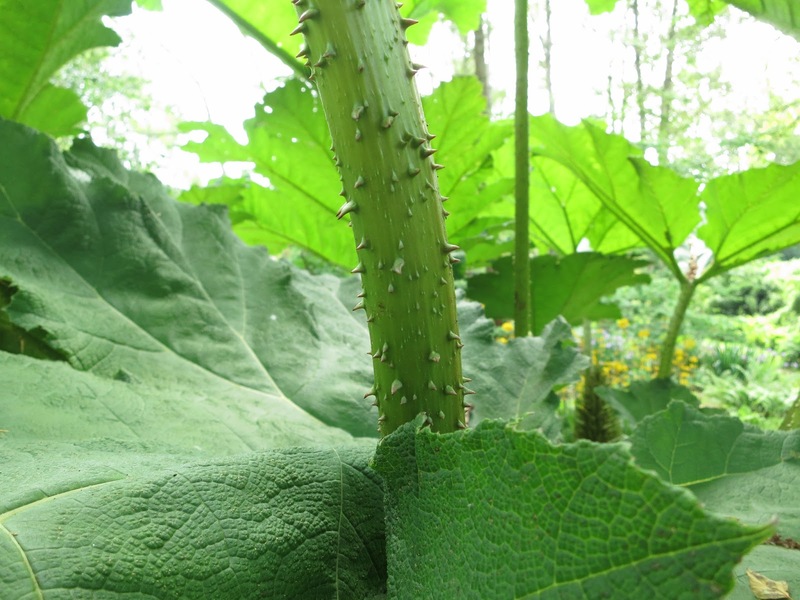 Love Gunnera. I want a couple for here when (if) we get to the truly wild part of the garden. 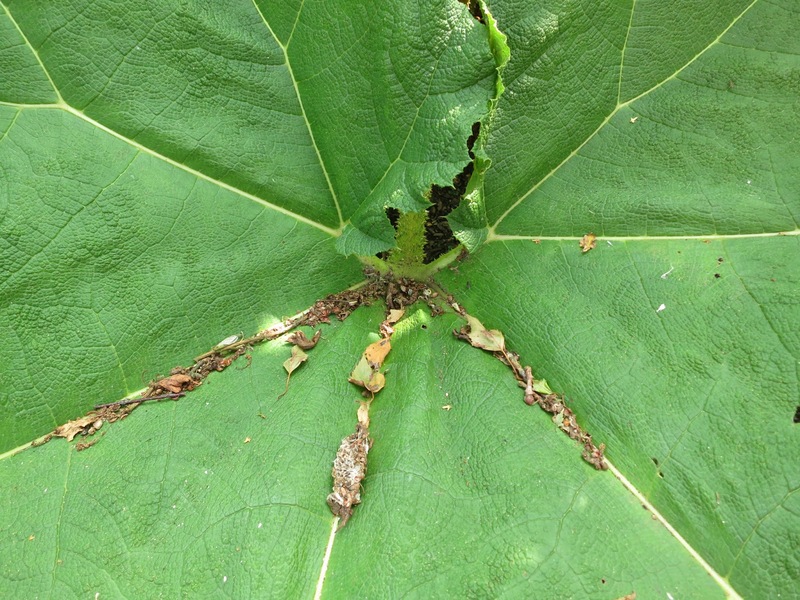 First time I met Gunnera in an English garden, I had a moment of pure terror. Like stepping into a parallel universe. 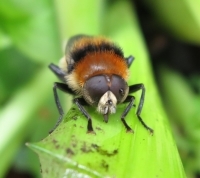 I've discovered a South African species with small garden manners, to add to my wish list. I think gunners are wonderful plants, prehistoric in feel, much like ferns, dramatic, exciting, a wee bit scary. I love walking amongst them, albeit carefully. And the flowers are extraordinary! There are loads growing in a ditch nearby, which makes me happy as I have no room for one in my garden. I really like Gunnera. If I had one in my garden I'd no longer need to worry about cutting the grass or weeding! I always remember Charlie from Ground Force seemed to like adding gunnera-shaped water features to the gardens they made over. I too remember the first time I saw Gunneras, I was blown away at the size of this amazing plant.